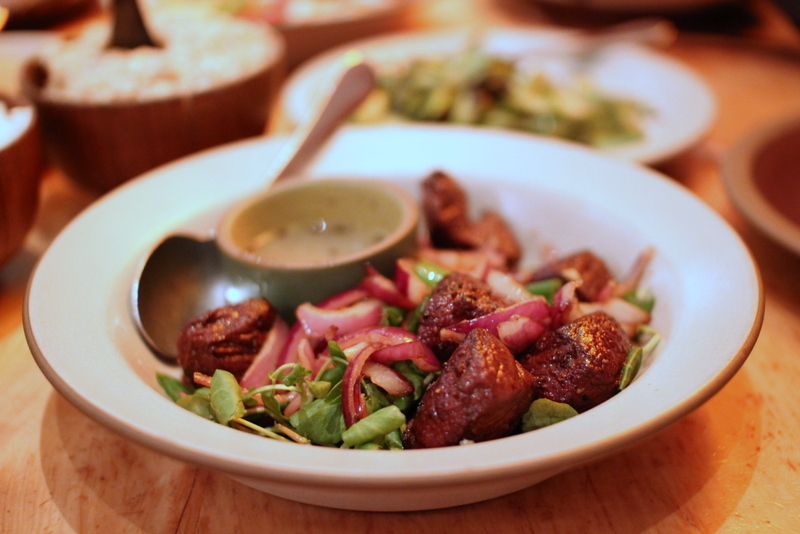 Resident Foodies say: We went back to one of our favorites in San Francisco, The Slanted Door in the Ferry Building. Pictured above is one of Chef Charles Phan’s signature dishes, the Shaking Beef. Phan has also shared his recipe to this marvelous dish. The Shaking Beef has just the right amount of crispiness on top, but tenderness inside. It’s perfection. 1. Prepare marinade by combining garlic, sugar, salt, pepper and oil in a large nonmetal bowl. Add filet mignon, combine and marinate, covered, in the refrigerator for two hours. 2. Prepare vinaigrette by combining rice vinegar, sugar, rice wine, light soy sauce, dark soy sauce and fish sauce. Set aside. 3. Heat a wok over high heat. Divide beef, green onions and red onions in half, as you will cook in two batches. 4. Add 2 T oil to the wok. When the oil starts to smoke, add first portion of the beef in an even layer. Let it sit until a forms a brown crust, about 2 minutes. With a spatula, flip the beef over to brown the other side, about 1 minute. 5. Add first portion of the green onions and red onions and cook for 1 more minute. Pour half of vinaigrette down the side of the wok, and then shake pan to release the beef and toss with the vinaigrette. Add 1 t butter and continue to shake pan until butter melts. Remove the meat and onions from the wok. Keep warm. 6. Repeat steps 4 and 5 with second portion of meat, green onions and red onions. Place the watercress in the middle of the serving plate and spoon hot beef and onions on top. 7. Prepare dipping sauce by putting salt and pepper in small ramekin and squeezing lime juice over it. Serve alongside the beef. Serves 4. 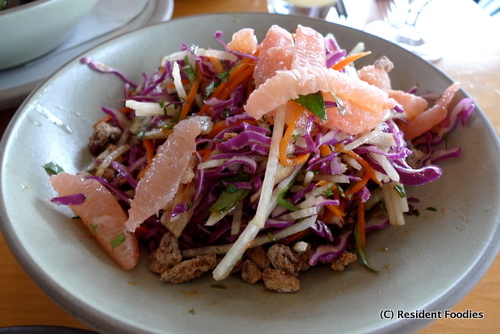 Dish: Grapefruit and jicama with red cabbage, pickled carrots and candied pecans, $11. Great combination of sweet and citrus. Love this salad. 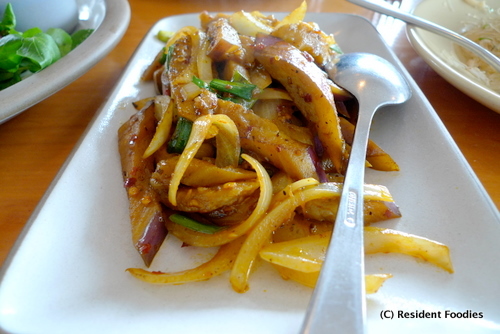 Dish: Chue farm spicy japanese eggplant with green onions and coconut milk, $10. Sweet, warm, and delightful. And we love the fall hue to the dish! If you would like the recipe, click here. Tidbit: 22 members of Phan’s family work @ The Slanted Door. The original restuarant located in the Mission did, in fact, have a slanted door. Resident Foodies say: Chef Charles Phan’s “family” restaurant started out as a hole-in-the-wall in the Mission in 1995 and quickly rose to mega-success. We were there in the beginning and have to admit that the old location had a lot of “ma-and-pa” charm that may be missing today–although the parking was a nightmare. But the Ferry Building location is large, majestic, and always crowded with both devoted regulars and many tourists. Throughout the past 14 years, the Vietnamese food has stayed true to itself–cleanly prepared with fresh ingredients and wonderful spices. Prices have increased since 1995, but it is so worth it.